Sometimes I have to make a dessert “just because”. 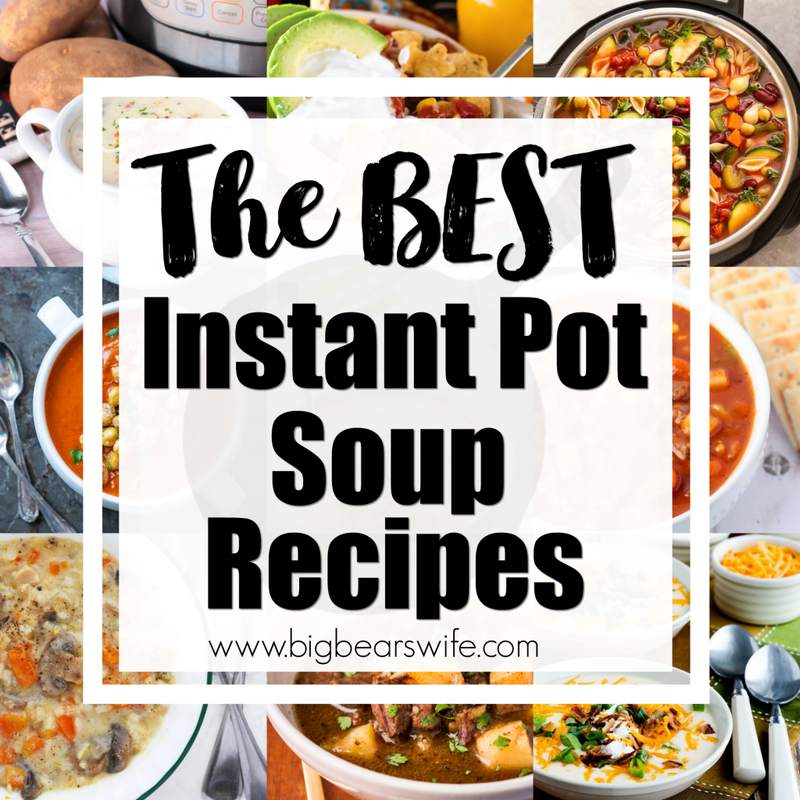 Just because I love my husband, just because it looks good, just because I want to get into the kitchen or just because it NEEDS to happen. 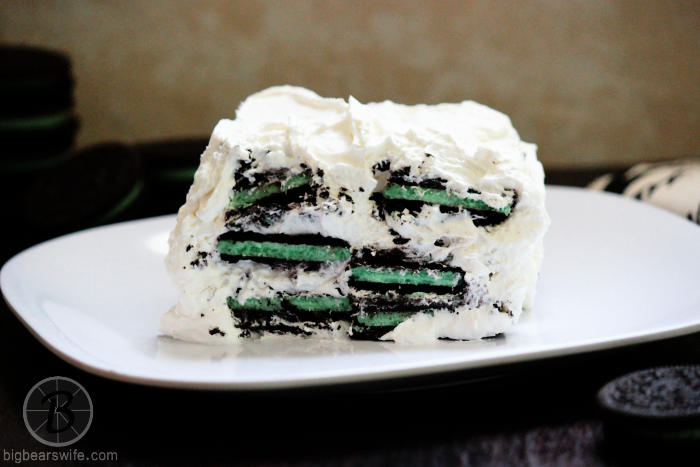 Like this White Chocolate Oreo Mint Icebox Cake, it just needed to happen. I’ve seen ice box cake all over the place. 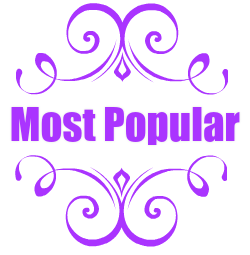 I’ve seen them in old cookbooks, at church lunches and all over the internet. 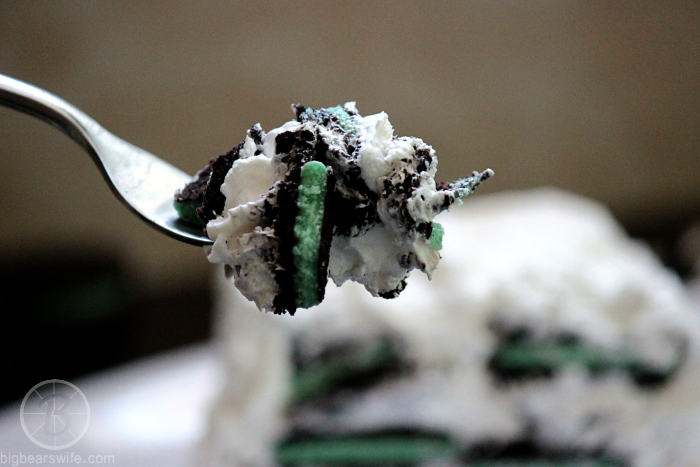 While I was browsing through a few of my favorite blogs the other day I ran across this, Oreo Icebox Cake from Cookies and Cups. As soon as I saw it I knew that I needed to make it for Thomas. 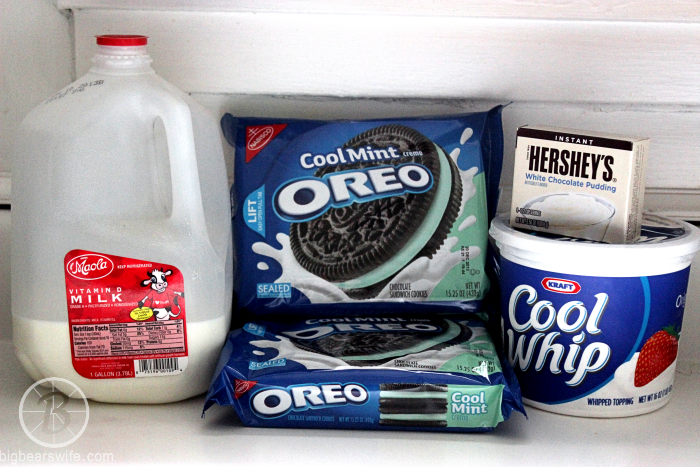 He loves every thing Oreo. 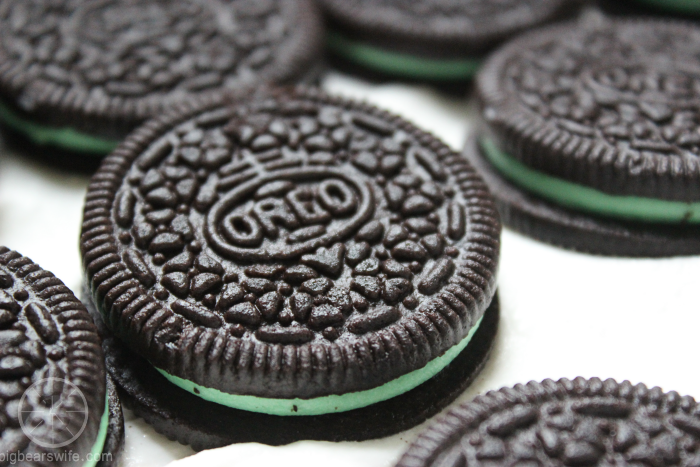 Oreo cheesecake, he needs it… Oreo ice cream, he’s in heaven…Oreo Cookies, he’d eat them all if I let him. 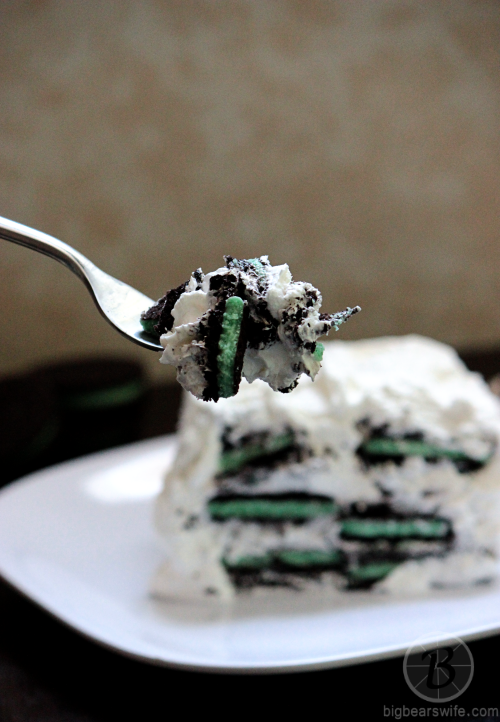 So I knew that this Oreo Icebox Cake would be right up his alley. 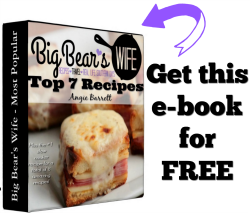 When I first started out to get everything I needed for this Icebox cake, I planned on making it exactly like the one that Shelly had made. 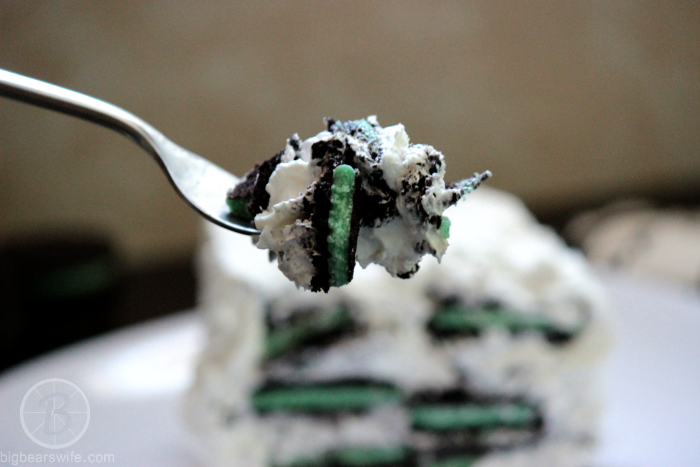 But then I got sidetracked, by Mint Oreos and white chocolate pudding. 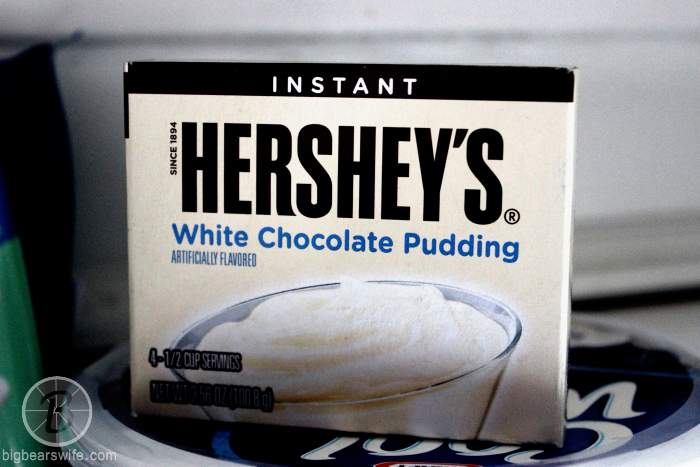 I didn’t even know that white chocolate pudding exist. Oh my gosh, it is good! 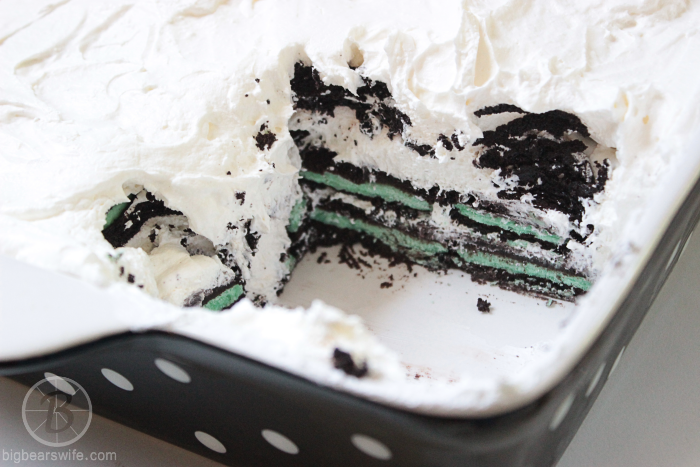 While my version of the icebox cake “derailed into mint heaven” and includes pudding, it’s still really easy to make and comes together in no time! 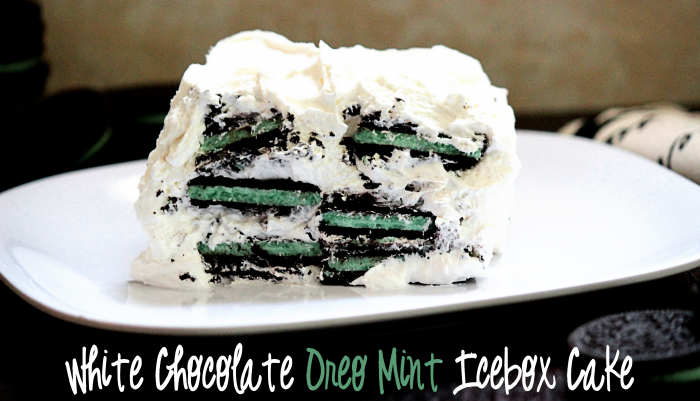 You only need a few things for this White Chocolate Oreo Mint Icebox Cake! First make the pudding. 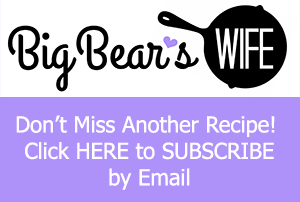 Combine 2 cups cold milk in a bowl with the white chocolate pudding mix. Mix well with an electric mixed (or in a stand mixer) for 3 minutes. Fold in the cool whip. 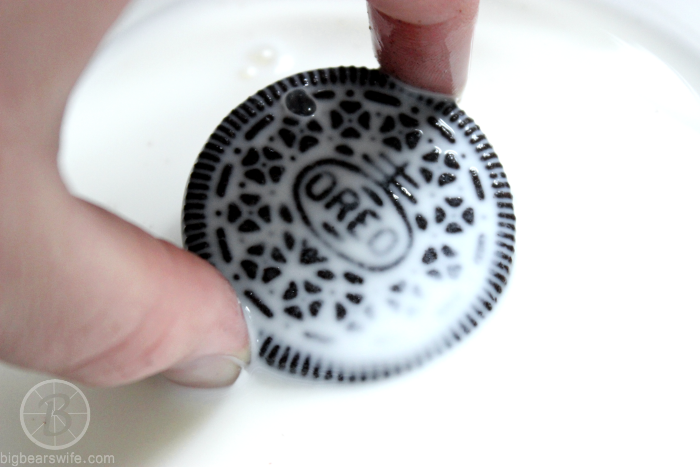 Remove the Oreo cookies from the package and dip each on into a small bowl of milk. You don’t need to soak the cookie, just one dip will work. 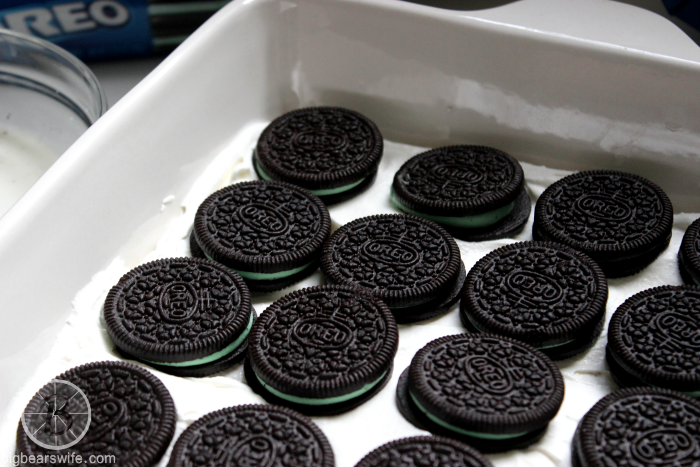 Layer the Oreos in a 9×9 baking dish. 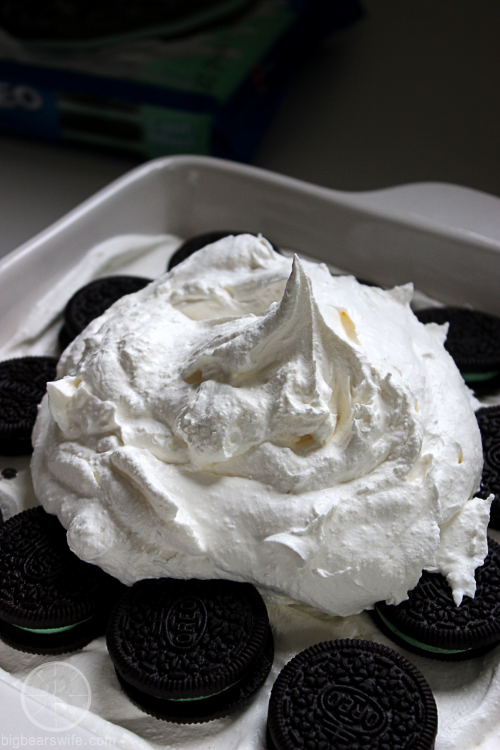 Add a layer of cool whip over the Oreos. 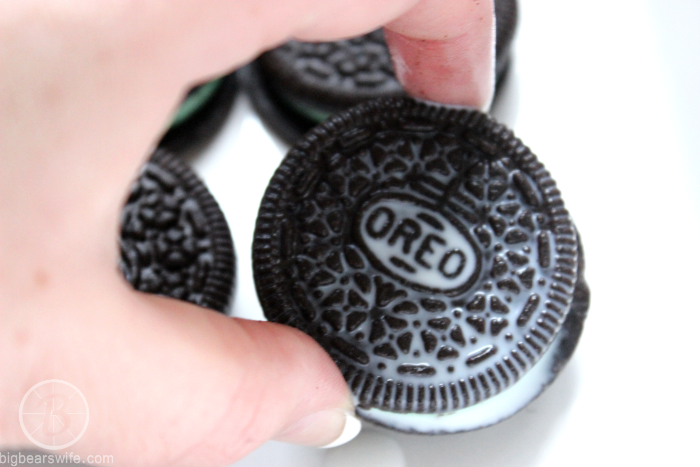 Add another layer of “milk dipped” Oreos. 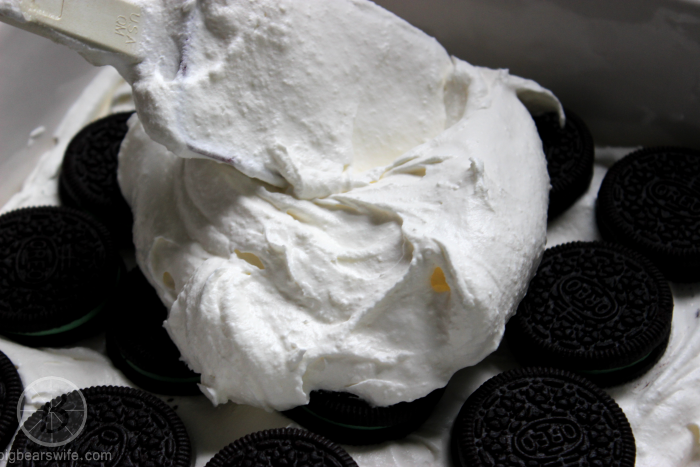 Continue until you have three layers of Oreos and four layers of cool whip. Then slice into this amazing dessert and enjoy! You’ll thank me. I promise! 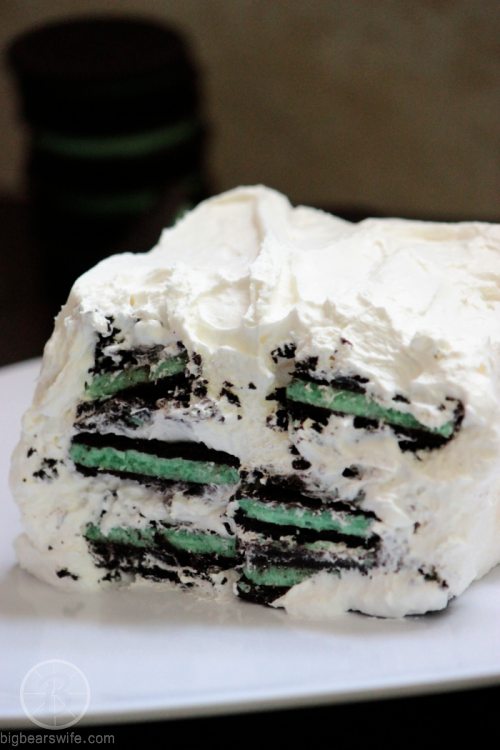 Continue until you have three layers of Oreos and three layers of cool whip. Ooooh when I saw the photos on instagram I was intrigued and OMG it’s better than I expected! This looks phenomenal! Woah girlfriend… this looks unreal! 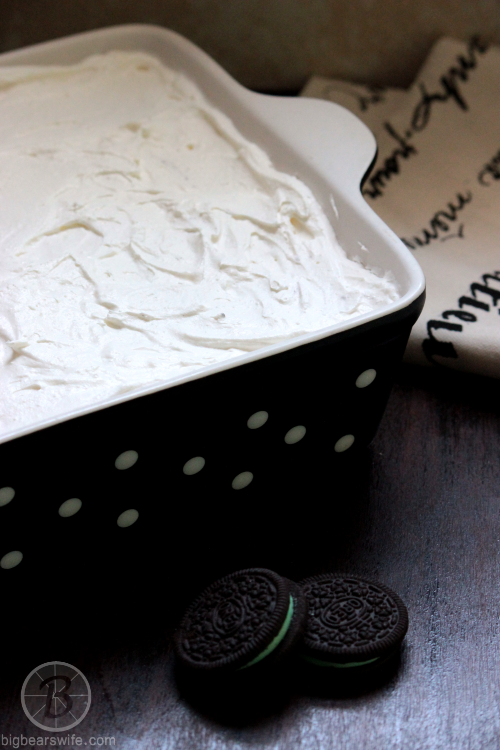 I must make an icebox cake asap! Oh my YUM! 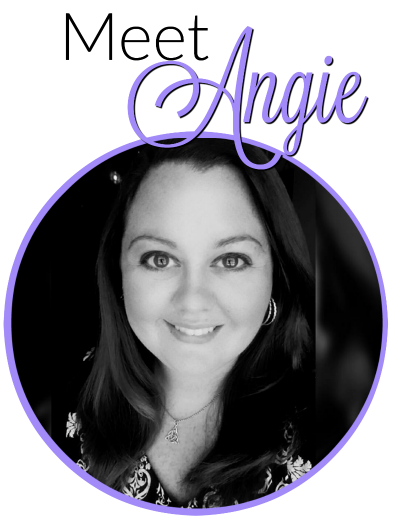 Looks amazing, Angie. This looks too good for words. looks like a yummy fluffy cloudy dessert, yum! Wow! I was not even looking for desserts but when I saw this I couldn’t think about anything else. Will be adding this to my list of desserts to make. The photos are beautiful! Hi Pam. It’s three layers of Oreos and three layers of cool whip 🙂 The Cool Whip is just the large, like the 16 oz container. We only have two sizes here that I know of.